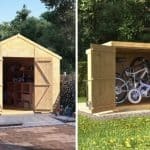 A garden shed is no longer just a dumping ground for your old tools and house clutter. 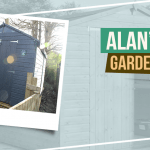 There’s so much more you can do with the space, so why not transform your garden shed? Whether it be a man cave or she-cabin, there are is tonnes of ideas you can take inspiration from. Here are 14 ideas for transforming your garden shed right now. Everybody needs a spot for their creature comforts. When you are fed up with not getting enough personal space at home, go to your garden shed. Clear away any debris and completely tidy the place up. Put in a big armchair, sit back and relax. It’s incredibly challenging for most of us to find time for a workout. It is even harder if you don’t have a gym on your doorstep. Finding the space to store everything at home is difficult, so move it. 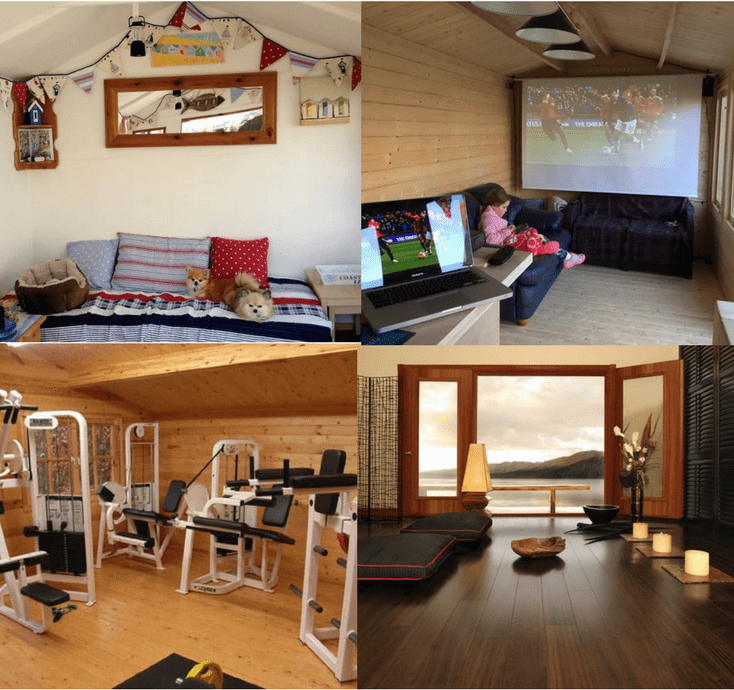 Kit the place out with heating, speakers, Wi-Fi, and even a television, bring the gym to you. Unless you have designated space at home, it can be incredibly difficult to focus when working on your personal study. 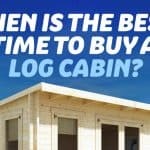 An office shed puts you in a work zone, so move over your computer and get comfortable. Band practice can be hard if you’re all crammed into one room. Design a space which is perfect to rehearse, then fill it out with space to hang guitars, store drum kits and even soundproof it. This will allow you to go wild with noise and not disturb the neighbours. Model train building is a very popular hobby amongst adults and children alike. Large train sets always end up taking lots of room in the house. A move to the shed might be the best way forward. You will have a big enough area for the whole track, but perhaps the best thing will be no disturbances. When you’re tired of stumbling over toys, or hearing the racket of a games console, then it’s time for a change. 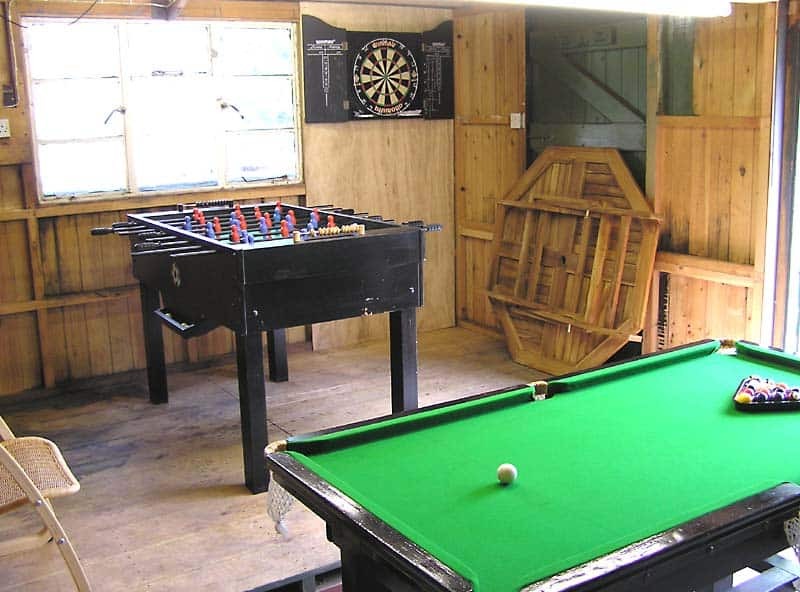 Create a games room in your garden shed just for the children and give them enough space to wreak havoc. If you want a games room for yourself, move in your games console, or snooker table and avoid ever having to be disturbed. It is incredibly difficult to be creative in cramped spaces, so expand out and turn your shed into a studio. Instead of having paintbrushes and notepads entangled in mess, give yourself enough storage space to have everything separated. Install a large canvas table and get creative. Yoga can be a great solution to stress after a busy week at work. However, it can be difficult to find a place which is stress-free, in your home. Create a space which completely avoids any distractions and moves the mats into your back garden. A home cinema is something the whole family can enjoy. Installing one into your home can be very costly and impractical. However, why not transform your garden shed into a luxury space to watch all your favourite films. Set yourself up with a TV or projector and surround sound and add some comfy chairs. DIY is part and parcel of maintaining any garden or house. But finding a space to do it, or having an area to organize your tools can be a problem. A shed is a perfect solution, giving you enough space to store your equipment and get on with your work. It can be incredibly difficult to find a spot at home just for your books. It is even harder to find somewhere, where you can actually read. Creating a home library in your garden shed is a fantastic solution. Put some bookshelves up, install a heater and move in a comfy armchair. Get your head in a book and hopefully, you won’t be distracted. 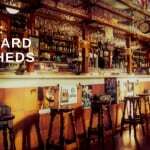 A pub shed is a great way to save money. whilst being the social hub of your friends. Get the place fitted with a bar, then install some pumps, or stack with your favourite spirits. After that, it’s as simple as decorating the interior. Install a darts board, snooker table or TV to finish off the pub feel. You could even choose a theme for your bar shed. If you are lucky enough to have a pool, then having a store is essential. A shed is a perfect space to hold all your swimwear essentials, not to mention getting dry. If you want to push the boat out even further, install a shower on the outside for rinsing off. It is fantastic having pets as they become part of the family. However, for some of us, it can be hard to constantly have a pet in the house. A pet house is a great spot for making sure your animals stay safe and comfortable, whilst remaining part of the family. Feeling inspired? 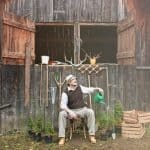 You can do so much to a garden shed with a little imagination! So give it a clear out and transform it into something you will really enjoy for years to come.